World-famous NBA teams return to City. City welcomed the Washington Wizards and the New York Knicks to CitySport where they prepared for their NBA London Global Game at the O2 Arena. The game between the two Eastern Conference giants marks the ninth time that the NBA has played a season game in London and the third time that they have trained at CitySport. Both teams will be looking to bounce back after losing their last game – the Knicks particularly focused on avenging their narrow defeat to the Wizards earlier in the season. During their visit, CitySport also played host to the world’s sports media and players from Arsenal Football Club, West Ham Football Club, and the Swedish Basketball Association. Local children from schools in Newham also got to train with the players at Junior NBA Clinics. Devin Robinson, small forward for the Washington Wizards, said: “This is my first time in London. I am loving it so far, the energy and aurora of the place is just beautiful. “We haven’t been here very long, but we went to Kensington last night and it looked amazing – very different to what we have in America. Speaking on the experience, David Adkins, Director of Player Development at the Wizards said: “I have never been to London before, so I brought my family with me and they are out touring your wonderful city. “The facilities are great and City has been very hospitable, everything we have needed has been here and we have been able to play some great basketball. “The NBA is an international game and it is great for our players to have opportunities to visit other countries to see how other people live. CitySport is the largest student sports facility in central London. 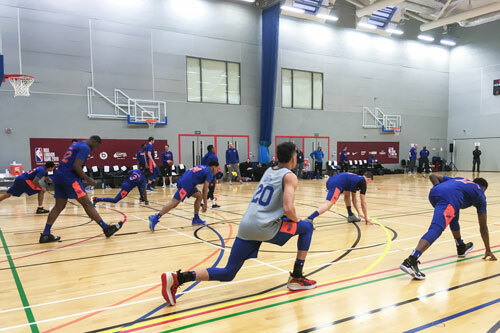 This marks the third year that it has hosted the NBA teams training sessions, and it was chosen due to the high-specification of the Sports England standard sports hall.